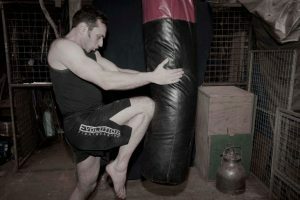 Monday night began the first lesson of my client’s specially tailored martial arts cross training course. The course will focus half on stand-up striking and half on ground-fighting. Unlike most lessons and cross-training courses, these areas will be unconnected and will not be united by a single theme. Rather they are areas the client, now a two year veteran of my teaching method, has specifically selected. We began with a look at the jumping push kick and the knee bomb, and finished with two escapes from side control. The warm-up consisted of specific callisthenic movements and dynamic stretching before we moved onto various basic setups for the knee bomb and the jump push kick. We began with some revision on how to use the teep as a jab and the use of the long-guard to maintain distance. Then I looked at details on the lead teep to ensure it was just fired off the spot rather than being telegraphed by the rear leg. We then put some power into hitting the mid-section, aiming for the spleen, solar plexus or liver. This action sends the opponent back into a likely shelling guard from where the fighter can launch the knee bomb to the ducked head. Next we looked at returning the teep to the chambered position to set up for the jumping push kick. A secondary set-up for this involved starting with a jab/cross and then turning an opponent to attack from a 180 degree angle. Ground work focused on escaping from pins. We began from the infamous side control. This position, so I was first told when my BJJ teacher began with escapes, is the one that most beginners have trouble defending against. As with my senior client on Wednesday, we went back over the reversal and the escape to half-guard into lock-down sweep. The lesson finished with contraction/relaxation PNF stretching.